A Visit to the Lands of the Striped King - Ghumakkar - Inspiring travel experiences. As the plane took off, I looked out the window to see a retroflect view of the airport behind me. With a heavy heart I bade adieu to my city but the prospect of going to the jungles was very stimulating and I was absolutely looking forward to it. 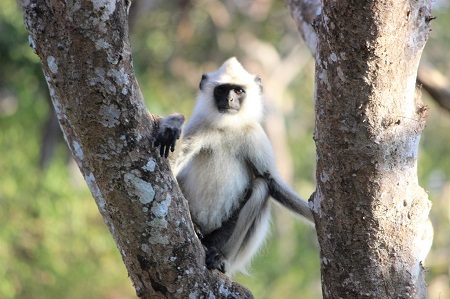 After pausing for a night in Mysore, we headed towards Nagarhole; one of the biggest national parks in South India. The drive was scenic with the roads covered with abundance of verdure. The resort where we stayed was in itself so beautiful that I hardly could be at rest; there was so much to explore. The trees burst into a riot of green and as I walked by them I could hear the chirping of the birds, casting a magical spell on me. After lunch we went for our first jungle safari. My husband and I was all geared up with lenses and binoculars. There were other tourists in the gypsy and as we drove into the depth of the jungle I could realise how that world is so distinctly different from the world outside. The quietness, the greenery and the sanctity of the place touched my soul and I was left absolutely speechless. 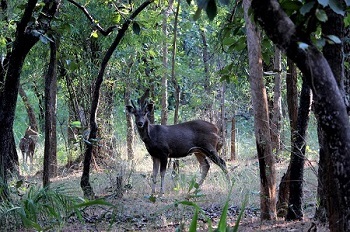 I was awakened up by the call of a barking deer and saw tourists pointing their lenses at it. Eventually we saw many animals and birds like the spotted deer, langurs, turtles, peacocks, cormorants, a covey of jungle fowl, sambars, elephants just to name a few; but had no luck with the tiger on that trip. The next day I started for Bandipur very early in the morning. 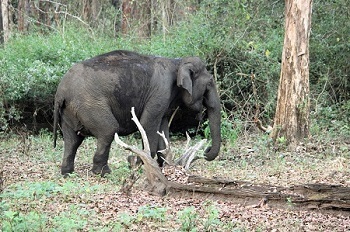 It is not far from Nagarhole so we had the chance to opt for a canter safari there. 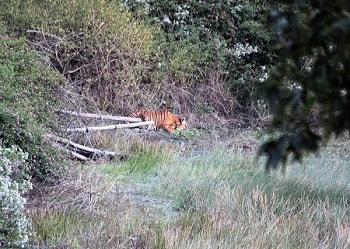 This time we were lucky enough to spot a tiger. The tiger was lazily basking in the sun and gave us ample opportunity to click its pictures. Everyone was extremely excited and wanted to click more. However, we returned to the resort with a very happy and satisfied heart. That evening we didn’t have much to do so hanged around the property, made some new friends, exchanged pictures and sat by the bonfire. The night was drawing in, I dipped into a wildlife article just before calling it a day. Suddenly, I heard some staccato sounds coming in from the veranda. I moved the curtain just to find a sounder of wild boars running around the adjoining garden. As I raised an alarm, some people came rushing in with torches and chased them out of the garden. It was a bit fearful but quite an amazing experience. Just a week before our arrival, a leopard had come inside the resort and attacked the dog. The footages were captured in the CCTV camera which the owner shared with us later on. In this macabre incident again, a brave heart had come to the dog’s rescue. However, such incidents keep happening in the jungle resorts and it definitely adds up to the charm of living in the jungle. The following morning, we set off with a naturalist for a nature walk. The man who led us was carrying a stick in order to shoo away the feral animals if they came too close. Walking through the dense forest and knowing that leopards and wild dogs are close by is quite intimidating and exciting at the same time. 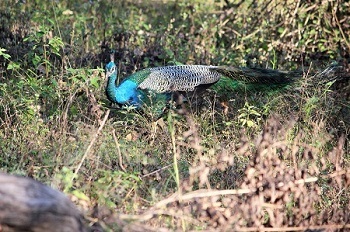 We did spot some peacocks and deer on our way. Later on, in the afternoon we went for yet another safari. The greed of spotting more tigers tempted us. As our jeep progressed we could see bisons and elephants roaming about. 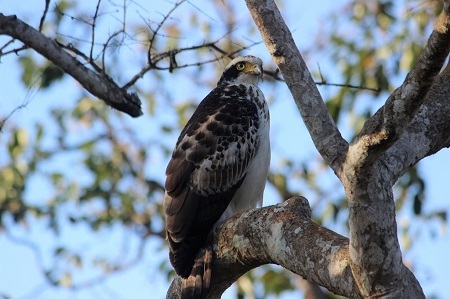 I also spotted a crested serpent eagle sitting on top of a branch and gazing down at us. Our driver parked the jeep by a waterhole, there were other canters and gypsys surrounding the waterhole and a tiger sat there drinking water from it. It was the cynosure of all eyes. I was awestruck at the sight of its beauty; had never seen a tiger so up, close and personal. All the other eyes ogled at it. While it drank with a lot of gust , the other animals were busy giving alarm calls to alert the jungle of the tiger’s presence. It was quite a hair-raising experience for us. The sun was going down so we headed back to the resort. The whole day was very eventful but I had my packing to do. So, without further delay I did up the luggages and also bolted in the door and windows of my room properly, in case the leopard comes in for a second visit. 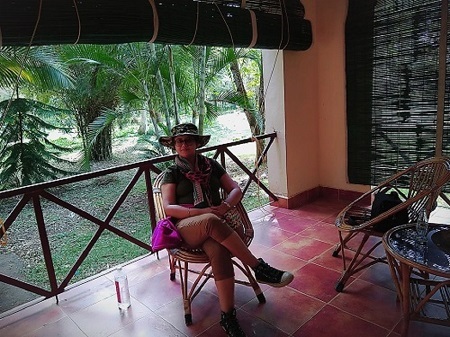 I did enjoy my stay in the jungle a lot. We were scheduled to leave for Ooty the next day. I was inundated with a lot of wild memories and fondly carried them back home with me. Excellent read. 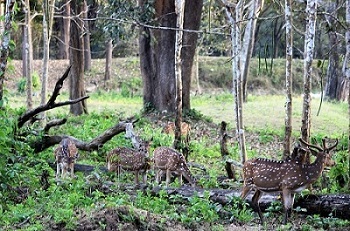 Living amongst the wild is a terrific experience in itself, visiting leopards and boar add to the charm. Photographs could’ve been of bigger size; pixel-light images appears to be robbing viewing pleasure. Thanks a ton Patrick for liking my post. It was indeed a wonderful experience visiting these renowned national parks down south and the back-to-back tiger sightings were a treat to the eyes! Thanks a lot for liking my story. After spending a day in Gangtok, I proceeded to Yuksom, a small town about 150 km away from Gangtok which can be reached via Rwangla or Rangpo. This is the place from where the trek to Dzongri, Goecha La and to the base camp of Mt. Kanchenjunga begins. The way to Yuksom is absolutely gorgeous with marvelous mountain views with green/blue watered Rangit river flowing in the middle of this Himalayn Kingdom. I started of on 27th September for Yuksam via Rumtek and Rwangla. At Rumtek, we gave lift to a couple of people from Rwangla.